Chris Van Allsburg should already be taking up a large percentage of your picture-book library, if he isn’t already. The detailed Caldecott-winning illustrator crafts books that vary from charming (Two Bad Ants) to disturbing (Jumanji), sometimes in the same volume. Undoubtedly his most famous work is The Polar Express, where he achieves both of these moods. Our young narrator is roused from his sleep in the middle of the night on Christmas Eve and taken on an uncertain journey, on a train where everyone is in their pajamas, and drinks hot chocolate “as thick as melted candy bars.” The mysterious train reaches the North Pole, of course, where the boy receives a special gift from Santa: a bell, which then slips out of his bathrobe pocket. Fortunately, Santa delivers the bell to him the next day, and in a conclusion that chokes up even the sternest of parents reading it aloud, as kids grow up, they can no longer hear the bell, but our narrator still can. Sad, sweet, and the best kind of sentimental. One in three small children (non-scientific guesstimate) will go through a train phase, which is another way of saying that they’ll go through a Thomas & Friends phase, seeing as the media and toy franchise is the Western world’s premier purveyor of cheery, talking steam engines. Thomas & Friends stories are set on Sodor, a fictional island in the Irish Sea shaped like the head of a chicken. They’re drawn from the Railway Series, a long-running cycle of children’s books written by Rev. Wilbert Awdry, a scarecrow-ish Anglican clergyman who had very strong opinions on diesel engines and the nationalization of British rail and was, like so many people in what we call “the past,” a touch racist. The current, very formulaic iteration of Thomas & Friends, produced by Mattel-owned Hit Entertainment, has tried to broaden the cast and setting in an effort to make more toys and appeal to non-English-speaking viewers (including Thomas & Friends’ large Japanese audience), departing from the handmade look and measured voice of the TV series’ first two decades and the vision of creator Britt Allcroft. Thomas & Friends maintains a very strict continuity that covers the history of Sodor (demonym: Sudrian) all the way back to Roman times, and the fact that it’s passed through several hands means that it’s now an ideological mess. Sir Topham Hatt is a parent figure who literally owns Thomas and his friends, which makes Sodor seem like a totalitarian state of child slaves, existing in a perpetual cycle of punishment and praise, the only reward being more work. But since one authority can often stand in for another, Sir Topham Hatt is also, sort of, God—sometimes an Old Testament God, as in “The Sad Story Of Henry,” one of the best and earliest episodes of the Allcroft era, but more often than not a God who is peeved that the engines have screwed with the natural order of things, but is willing to welcome them back into the berths of Tidmouth Sheds once they atone. It should be noted here that the engines of Sodor don’t actually require crews; they have free will. 3. Who needs Thomas when your kid can watch YouTube videos of actual trains? If you received a copy of this book at your baby shower or kids’ early birthday and it looked really familiar, it’s because it’s likely the same version you grew up with. The first version of The Little Engine That Could that most of us know came out in 1930. Before then, however, the book’s origins are a bit murkier, even as the volume has entered our general vernacular (“I think I can… I think I can”). Last year NPR’s All Things Considered interviewed hobbyist researcher Roy Plotnick, who looked into the story for more than a decade. The book’s origins have been traced to a minister’s sermon in 1906, as well as a 1916 publication called The Pony Engine by Mabel Bragg. The author of the 1930 edition, “Watty Piper,” is a pseudonym of book publisher Arnold Munk. Platt & Munk received another claim that the story was written by somebody else around 1950, which was settled out of court in 1955. In any edition, the story has lasted this long for a reason. A train loaded with toys and other good things for the kids on the other side of the hill conks out. Other engines refuse to help the train, saying that they’re too important, until the little blue engine steps up, and pulls the train over the hill through the force of positive thinking. The extreme level of your kid’s train obsession may actually help you as you head out on countless errands and try to keep the youngsters from screaming from their car seats. 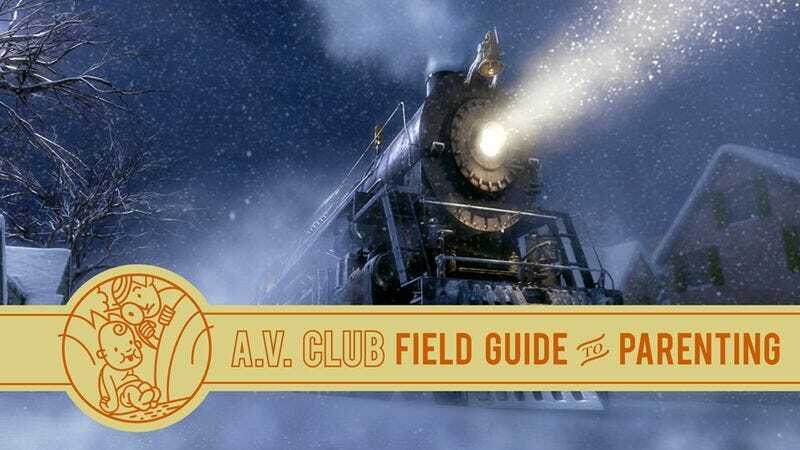 A train-song playlist can make these endless journeys a little less painful, so we’ve pulled together a quick list to help you kick this off, with selections more palatable than “I’ve Been Working On The Railroad” (like “Rock Island Line”). First up, Ralph Covert’s rock band, The Bad Examples, became most famous for “Not Dead Yet,” a song put to effective use in Six Feet Under. Since then, Covert has gone on to create his own cottage industry of kids’ songs that parents can actually stand to listen to, under the imprint Ralph’s World. Knowing his audience, Covert included the catchy “Choo Choo Train” on his very first album, a nice throwback to classic train songs, even as he tosses out routes that are impossible, like Chicago to Amsterdam. The standard “Little Red Caboose,” while cute, can be cloying, so our favorite version is by Laurie Berkner, another kids-music staple, which is nicely streamed-down and twangy. But it’s never to early to start introducing your kids to the classics, like Arlo Guthrie’s version of “City Of New Orleans,” Elvis Presley’s “Mystery Train,” and Boxcar Willie’s “Wabash Cannonball.” If you want to go the show-tune route, Judy Garland made the hummable “On The Atchison, Topeka And The Santa Fe” famous in the 1946 movie The Harvey Girls. And The Monkees’ “Last Train To Clarksville” is never a bad idea.